Collectors’ Night 2017 was a huge success! Last Saturday, nearly 300 people come to The New York City Fire Museum to see over 30 collectors show diverse collections ranging from Beanie Boos to business cards for Chicago street gangs. Guest speaker Miriam Sicherman presented her Closet Archaeology project she has worked on with her 4th-grade students, and LuLu LoLo performed her collector obituary monologues. Check out the pics below. Thanks again to the sponsors for this event: The New York City Fire Museum, Two Boots Pizza, and Brooklyn Brewery. See you next year! Roger Clark from NY1 visited us to talk about Collectors’ Night with Reliquary Founders Dave Herman and Bill Scanga. Collectors Brandon Johnson, Miriam Sicherman, and Harley Judd Spiller showed some of their collections, and a few of the City Reliquary kid collectors made an appearance too! 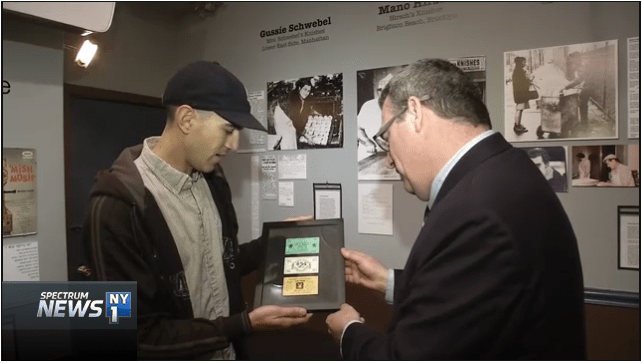 Roger Clark of NY1 visited us to talk about Collectors’ Night! The City Reliquary Museum is proud to present its annual Collectors’ Night on Saturday, April 8 at the New York City Fire Museum. Collectors’ Night celebrates one of the quirkier cultural practices of everyday New Yorkers. Every year, artists, packrats, and other unusual archivists gather to show off their collections. Displays range from the charming and quotidian to the intriguingly morbid. Special presentations by guest speakers focus on a specific area of collecting. Schoolteacher Miriam Sicherman of the “Closet Archeology” project will discuss the early 20th-century debris found by her 4th graders under the floorboards of their 1913 NYC public school. See coverage from the New York Times. Mike Zohn of Obscura Antiques & Oddities will discuss his collection of original artwork from 1960s & ’70s Mexican comic books. And a special performance from artist and activist LuLu LoLo of the Where Are The Women Monuments project. LuLu will perform two short monologues drawn from the obituaries of Elizabeth Tashjian, founder of The Nut Museum, and Hugh Hicks, whose massive light bulb collection formed the Mount Vernon Museum of Incandescent Lighting. Industrial Revolution and Mechanical Era ephemera from Museum of Interesting Things. With interactive demonstrations. 100 years of paper, cardboard and self-playing ephemeral records from Michael Cumella aka Phonograph DJ MAC. Some records will be played on site. 12 reproduction mechanical banks from Georgine and Bill Eberight. Includes coin demos. Business cards of Chicago gangs from the 1970s & ’80s from Brandon Johnson. Brandon’s collection of gang “compliment cards” has been published as Thee Almighty & Insane. The book has been reviewed by Vice. Classic educational filmstrips from Jonathan Sims. With projection of some strips. Archival 16mm vintage cartoons by Tommy Stathes of Cartoons on Film. Screenings throughout the night. And the City Reliquary Kid Collectors! Featuring the collection of “O” shapes from Opal Herman, the geisha doll collection of Rosie Herman, the miniature action figures of Gwen Rosenstein, and the Beanie Boo & Pokemon collection of Olive Scanga! Refreshments courtesy of Brooklyn Brewery and Two Boots Pizza! Tickets through Artfully, $7/$5 for City Reliquary or Fire Museum members. Become a Reliquary member today! Admission at the door will be $10/$8 Reliquary and Fire Museum members. Buy online and save! Check out a few pics from Collectors’ Night 2016, and see more on our Facebook page. SIGN UP AND SAVE THE DATE!! 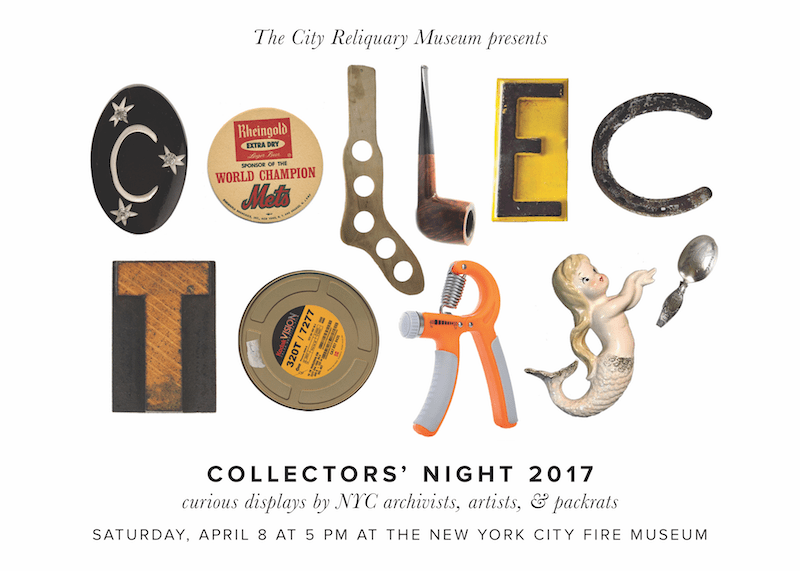 The City Reliquary Museum is proud to present its annual Collectors’ Night on Saturday, April 8 at the New York City Fire Museum. Collectors’ Night celebrates of one of the quirkier cultural practices of everyday New Yorkers. Every year, self-proclaimed archivists and packrats of every stripe gather to show off their collections. Displays range from the charming and quotidian to the intriguingly morbid. With special presentations by guest speakers. This year’s special guests are Miriam Sicherman of the Closet Archaeology project, Mike Zohn of Obscura Antiquities and Oddities, and artist and activist LuLu LoLo of the Where Are The Women Monuments project. To showcase your offbeat assemblage in a table display, submit the form below. A 6′ long table will be provided–see Event Details. You’ll also be invited to participate in the evening’s Rapid-Fire Show & Tell! We’ll accept submissions through Friday, March 24. For a mention in our press release, please respond by Monday, March 13. A $10 fee will reserve your table and help support The City Reliquary. You can submit the $10 table deposit in the Other field on our Artfully donation page. Be sure to note “Collectors Night 2017 table” in the Special Instructions area of the Checkout page. Collections will remain in the care and protection of their owners. The owner understands that photo documentation may be taken of his/her display and used for press and other promotional purposes. Protective measures will be taken to assure that all collections are respectfully guarded from harm, but neither The City Reliquary nor New York Fire Museum is responsible for any damage or loss. Presenters will transport and set up their collections between 3:00 and 4:30 PM on Saturday, April 8. Collectors must remove displays from the premises by 9 PM. We invite you to display your collection as creatively as you wish. In the past, collectors have taken a “school science fair” approach and used a trifold display board. Flat objects, background information, or titles and informative labels work well against a cardboard backdrop. Helpful display accessories include: small boxes to raise objects; fabric to drape over table tops; glass or Plexiglas/acrylic vitrines; pins; clips; labels; extra lights; and extension cords. The New York City Fire Museum does not allow collectors to attach anything to the walls of the ballroom.